Early on in Don Hertzfeldt’s It’s Such a Beautiful Day, the central character, Bill, drops his keys onto his desk. This simple, benign, totally regular occurrence sets him off remembering all of his other everyday tasks: brushing his teeth, closing the door, turning on and off a lamp. He wonders how much of his life has been squandered on such meandering work, quickly realizing that the tasks are in fact what make up his life, and that the other stuff around it are the exceptions. In a short sequence, Don Hertzfeldt quickly sends Bill (and the audience with him) down an existential road into what makes up our lives, and what those moments might mean, if anything. Bill is a stick figure more fleshed out and human than just about any flesh-and-bone character from last year (or most years, really). Over the course of 60 minutes, we watch him go about his life, from the mundane (eating crackers, watching television) to the epic, retelling his personal history in Steinbeckian fashion. It becomes clear early on that Bill is ill. Hertzfeldt never gives us the specifics, but it is definitely brain-related, often dealing with memory loss and seizures. These episodes of brain malfunction are devastating, especially when set against the tremendous use of classical music, but they serve a larger purpose than simply getting the audience to sympathize with Bill; this is a man who, due to his condition, has a translucent, almost enlightened look at the world around him. Little details pop out and stick to his constantly refreshing mind, gradually forming a new whole before being crudely wiped by forces he can’t control. A paper bag rustling in the wind; a television replay of a boxer getting his head split open; a sandbox with the words “I LOVE YOU” etched in it. These images become so much more than plot devices or pretty things to gaze upon. They are the moments in Bill’s life, and we share his emotional response to each one – the fear, the melancholy and the beauty. As an aesthetically-driven film, the stripped down animation is hardly a limitation. Hertzfeldt’s use of hand-drawn animation and 16mm film allows the animator a sense of weight and texture that even the best CGI couldn’t boast. Beyond that, the soundscape is so intricately detailed that one may find themselves watching the film with their eyes closed. His collage of sounds supplies a visceral energy, one that subtly and smartly drops out almost completely at various points, providing certain scenes with an almost overwhelming sense of weightlessness. 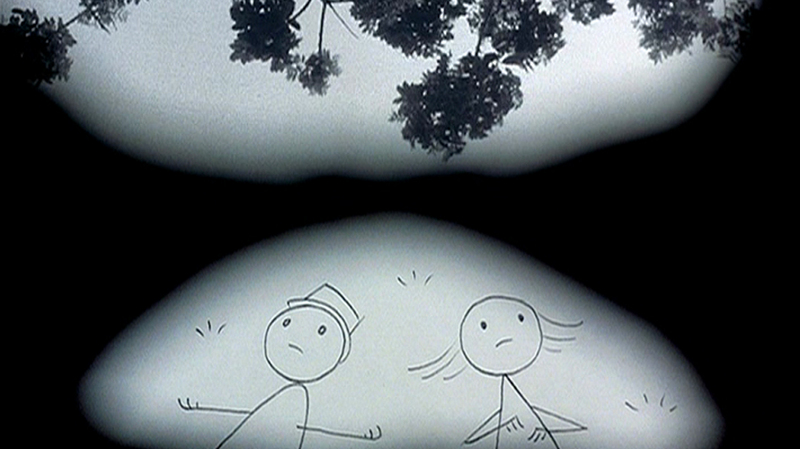 Visually, Hertzfeldt separates the frame into fragments through the use of old fashioned iris shots, symbolically reflecting Bill’s detachment from the outside world as well as the filmmaker’s own detachment from modern technology, favoring instead “outdated” techniques. The entire aspect of autobiography is hard to ignore when watching It’s Such a Beautiful Day. Bill is not some avatar for Hertzfeldt, but at times the story becomes so intensely specific that one wonders how he could write this stuff without a personal reference. Whether or not the story is fabricated ultimately does not matter, though, because it does something much more important: it feels like reality. Most of us don’t struggle with memory loss, or seizures, or families that are dysfunctional to the point of caricature, but all of us at one point or another have been preoccupied with the fear and fascination of death. Bill thinks about death constantly and it rules his everyday life more than any conceivable illness. He dies several times throughout the film, often in dreams, but he’s never truly dead. Hertzfeldt is not interested in questioning what happens after death, or how to stave it off, or even how to ignore its lingering presence. He only wishes to impart the boring yet unmistakable fact that we must take what we have and never forget it, a message better communicated in It’s Such a Beautiful Day than a thousand “Seize the Day!” films mushed together. The world is a weird, dangerous, contradictory place, often a cage of anxiety and fear. But sometimes, the cage is lit by moonlight, and it becomes something much more, something beautiful. Tags: Joel Kalow. Bookmark the permalink.